Why: Increase access to upper frets - appeal to banjo players switching to guitar. Banjos were a popular instrument in the 1920’s because they were loud. Guitars were replacing banjos in popular music and some banjo players were switching to guitar. If you were a banjo player you were used to having all frets clear from the body. Guitars at the time, still based on classical and Martin designs, all had the neck join the body at the 12th fret or half the scale length. This gave a full octave playable on each string before the neck reached the body. Perry Bechtel, a banjo player, came to Martin and asked that they make a guitar where the neck joined the body at the 15th fret. This would make it more familiar and appealing to banjo players. Martin compromised and made a guitar where the neck joined the body at the 14th fret. They named the new model the Orchestra Model. So how did they accomplish this. They modified two design features to add the two extra frets. First, they made the body length a bit shorter. You can see this in the following table (note the table is from current specifications on the Martin website and not the dimensions of 1929 guitars). Then they moved the location of the bridge (and thus the neck) so it was farther from the end pin. Ta Da! A 14 fret guitar. I own a Martin OM-28, the direct descendant of this innovation. This changed spread quickly and within a few years almost all guitar manufacturers 1 were making guitars with 14 fret neck joins – often eliminating the 12-fret models. Was it a good change? Certainly the 14 fret join is the most popular style of steel string acoustic guitar. But a few finger style players believe that the bridge is no longer in the “sweet spot” of the guitar body and thus doesn’t sound as good. Also, the smaller body reduces the volume of air and affects the sound. This is part of the reason why 12 fret models as well as 13 fret compromise guitars have become popular among many finger style players. One of the promoters of the 12-fret OM design is Eric Schoenberg. He has designed guitars for Martin, designs and sells his own guitars and collaborated with others. Recording King guitars currently has a Schoenberg model. 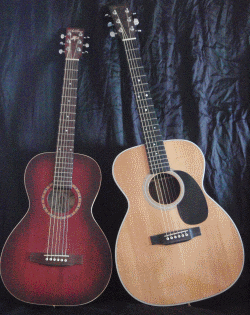 Martin 000 12-Fret (left) and Martin 14-Fret OM-21 (right). Notice how the body shape is flatter on the 14-fret guitar (right) near the neck where the length has been shortened compared to the 12-fret guitar on the left. According to Wikipedia, Gibson actually had a 14 fret guitar before Martin. It was on their L5 archtop guitar. So, Martin was the first flat top guitar to have the neck join at the 14th fret. I have been doing some research on the 14 fret story and Perry Bechtel and am finding it is just that…. A story…I find it interesting that in 1929 Bechtel ordered what some are calling the first 14 fret flat top guitar. I started digging and studying pictures taken in the late 1920’s of guitars used by the Mummers in Philadelphia. While looking at a picture taken in January of 1931 of the Mummers in Philadelphia I noticed a 14 fret OM type guitar. It was a 14 fret Jimmy Rogers Model only in Rosewood. So having a deeper body and width between an 00 and 000 size… Just over 14 1/2″ widest point at lower bout. Certainly an Orchestra Model … how do I know the size? I tracked the guitar down and I bought it. The guitar was ordered in January 1930 for a famous banjo player who was a member of the mummers. I am not giving out more info yet as I promised the family I wouldn’t. However this guitar was ordered as a 14 fret Jimmy Rogers guitar with Rosewood because it was to be a birthday gift. The spruce top matches the Jimmy Rogers model all appointments. The body size and planetary tuners are also identical. but that is where it ends. The headstock is the same form but boasts a rosewood veneer. Something Weymann often used on very high end banjos, style 6’s often used Rosewood veneers. It has a stamped date on the headstock of 11 -14-1930 the birthday of the man it was made for. His wife wanted to surprise him on his 40th birthday and as he had a Weymann banjo with a rosewood resonator she wanted the guitar to match the banjo. He loved Jimmy Rogers and he played a plectrum banjo, thus the request for a larger scale neck. The back of the guitar has the same center stripe with diamond design as the Jimmy Rogers only it’s a two piece book matched BrazilIan Rosewood back. Likely a one of a kind guitar until I found another picture. Now after letting everything settle in I am re-writing guitar history of the OM -28. Being the first 14 fret to the body flat top. I then started looking at other pictures of Mummers in the Philadelphia Mummers Museum collection. Low and behold in a January 1, 1929 picture another Weymann guitar with a 14 fret to the body neck is clearly present. I was unable to track this one down but it is clearly pictured and I can count frets to the body. This is prior to Perry Bechtel’s order and discounts C.F. Martin being the first to produce flat top guitars with 14 frets to the body. So the Bechtel Story is OUT. Weymann made 14 fret to the body flat tops before Bechtel ordered his from C.F.Martin. Why do I believe this. First I own one of the Weymann guitars, secondly The Weymann Company was a producer of some of the finest Orchestra Model Banjos made. By 1924 the tenor banjo was growing in popularity and would replace the traditional five string banjo as top seller. Weymann having the Mummers in Philadelphia as Customers was a much more likely Company to be the first to produce the Modern 14 fret flat top guitar. The Company was not well known for guitars but had very loyal banjo customers and also was producing the finest quality banjo guitars being made during this time period. I own one of those guitar banjos as well. mine was made in 1925. It makes sense that Weymann knew enough about guitars to take on making guitars that were more “banjo like” that included longer scale necks. I have also found specific nuances to Weymann builds that were not guitars made by Vega or Wurlitzer as some have suggested and inferred that Weymann did not make their own guitars. That is completely false. Although Weymann did offer instruments manufactured by other Companies in their Catalog, the Weymann badges exclude the phrase “manufactured by” on those instruments..I have found that all Weymann builds seem to say “manufactured by” and those with just Weymann Company badges that do not contain that phrase are suspect of being produced by other makers. There are many different Weymann decal badges and at some point I would like to collect pictures only if for a better Historical reference point. I will try taking pictures of my Weymann instruments to get the ball rolling. Weymann production of high grade instruments was rather small an estimated 500 or so a year.Very few guitars were produced but there are specific nuances on Weymann built guitars. They used planetary tuners built exclusively for Weymann instruments. these were used on the late 1920’s to early 1930’s Weymann built guitars. They used a low profile block edged bridge ( picture a pyramid bridge with the pyramids cut down to 3/16 of an inch”). Weymann often used inlaid tortoise pick guards and purfling that was inlaid on top of the guard to complete the pattern. There are more subtle nuances that lead one to believe that the Weymann Company made many of the guitars ordered in their own shop. This is a study that should be continued not only because it’s historically important, but because it seems the C.F.Martin Company is constantly getting so much press that we forget other builders made very high quality instruments. Value has been placed on stories and the image of iconic instruments like the OM-28 but it’s time for a taste test. For instance my Custom Weymann Jimmy Rogers OM sounds as good as a Martin OM 28 and well it should, it boasts the same x braced top and ladder braced back, It has the same quality build and the same materials and was made at the same time. Because of stories like the Perry Bechtel story, other Vintage guitars become highly undervalued and under appreciated. In order for us to appreciate these undervalued instruments we need to correct History that has been slanted in the direction of the dealer in guitars rather than in the true History of guitars. It is certainly a fact that both the C.FMartin Company and the Weymann Company were producing 14 fret flat tops at the same time. Giving Martin credit for the first one is not Historically correct. At best these two Companies share the same stage of the development of the 14 fret flat top guitar. Thank you for sharing your historical research. I have occasionally found stories questioning the Perry Bechtel story regarding the first 14 fret flattop guitar. In fact, I find any number of claims regarding “firsts” to be dubious. The story I gave is the story Martin currently claims to be true. They of course are biased. I appreciate your research and effort to get the story right. Thanks again.